The Models 765M30 and 765M35 High Intensity Acoustic Sensors (Microphones) are designed for the measurement of gas-borne sound in industrial applications. These sensors have been constructed for use in corrosive environments that are compatible with the type 316 stainless steel diaphragm. The electrically-isolated, coaxial stainless steel hermetic connector, when combined with the all-welded construction, provides a true hermetic seal. Electrically, the Models 765M30 and 765M35 comprise sensing elements of piezoceramic material in a balanced and floating configuration to provide enhanced rejection of electrical noise associated with many industrial environments. An internal accelerometer provides cancellation of the acoustic element's inherent acceleration sensitivity. Optimum performance is achieved when used with a true differential input amplifier. 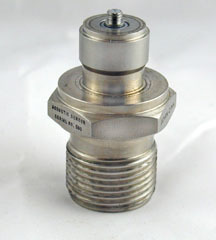 Consult the factory for customized versions of this sensor. 1.0 pC/g Typical, 2.0 pC/g Max.